The Toyark › Marvel Toy News › SDCC 2013 Deadpool Corps Revealed! Sweet, this is too cool I'll be getting this for sure! 50.00.... man, my wallet is dying. So glad I gave up on MU. This set is very disappointing. Me das cinco tacos de los pinche pendejos rojos, por favor!. I love SDCC! Good thing I only care about this and the Thunderbolts pack...crap and the Green Lantern pack. As weird as this may sound I'd rather have a Headpool accessory than another Deadpool...but yeah $50 is steep. Hilarious though! Yeah I'm picking that up just for the package. I was probably expecting this but still had the hope it would be a regular release. I don�t see why a pack like this wouldn't sell with high profit at regular retail. Yet they still prefer to release horrible Wolverine figures that will never sell at regular retail. p.s. Any good samaritan that could grab an extra one for me and willing to negotiate a price? 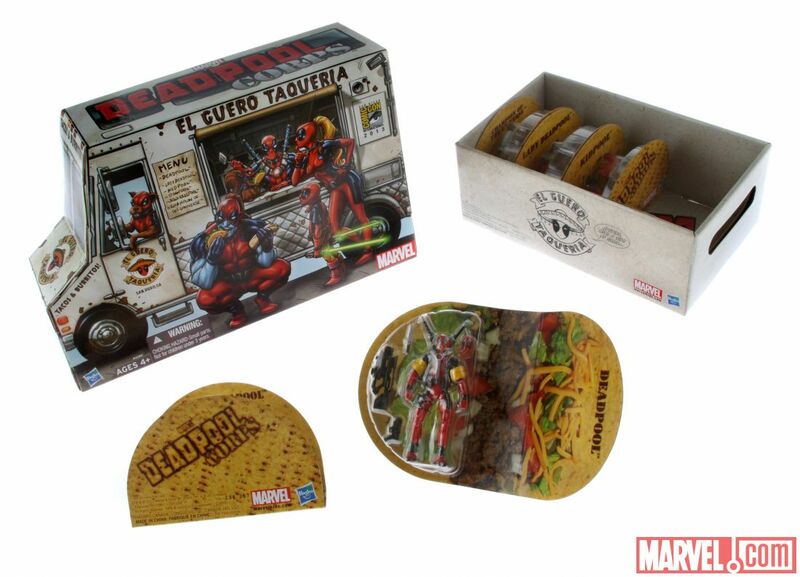 Look carefully at the taco package of Deadpool. 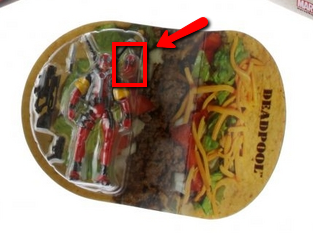 It seems that Headpool is packaged next to his head as an accessory? I noticed that too and came to the conclusion that he is just card artwork (since I don't see his propeller hat and Headpool is also not in the menu (on the truck package). Edit: nope definitely not card artwork. The card artwork is taco filling lol. Its definitely a headpool of some sort, if not just an extra Deadpool head. Looks like there is enough room for 5 tacos. Looks great and the packaging idea is excellent. So glad there is an MU set!!! Sorely tempted to get this. And $50 isn't all that bad, considering the number of figures and packaging. Plus, it's a Con exclusive so it would be more expensive due to the smaller run and limited availability. No Headpool, no deal. That's definitely only an extra head too, next to the main DP figure. As disappointing as it is, I doubt they would make a Headpool figure, simply because he's from the Marvel Zombies universe. Marvel is pretty firm on not releasing any more toys based on their appearances. Even if it's just a head. The Kidpool being loosely or un-articulated is a bummer, and while the effort on the set is pretty awesome, I'll be able to pass easily! Have fun with it guys, it looks like a pretty cool set. I can confirm that Kidpool and Dogpool have zero articulation. Hmm. Squirrelpool is listed on the Menu on the Taco Truck and is seen holding a taco in the picture. I bet he'll be another tiny pack-in with either Championpool or Lady Deadpool. edit. duh nevermind I just looked at the main pic haha.